Russian poet and man of science, born in the year 1711 in the village of Denisovka (the name of which was afterwards renamed "Lomonosovo" in honor of the poet), situated on an island not far from Kholmogori, in the government of Archangel. His father, a fisherman, took the boy when he was ten years of age to assist him in his calling; but the lad's eagerness for knowledge was unbounded. The few books accessible to him he almost learned by heart; and, seeing that there was no chance of increasing his stock of knowledge in his native place, he resolved to betake himself to Moscow. An opportunity occurred when he was seventeen, and by the intervention of friends he obtained admission into the Zaikonospasski school. There his progress was very rapid, especially in Latin, and in 1734 he was sent from Moscow to St. Petersburg. There again his proficiency, especially in physical science, was marked, and he was one of the young Russians chosen to complete their education in foreign countries. 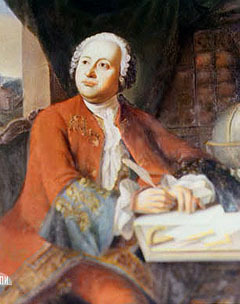 Lomonosov accordingly commenced the study of metallurgy at Marburg; he also began to write poetry, imitating German authors, among whom he is said to have especially admired Günther. His Ode on the Taking of Khotin from the Turks was composed in 1739, and attracted a great deal of attention at St. Petersburg. During his residence in Germany Lomonosov married a native of the country, and found it difficult to maintain his increasing family on the scanty allowance granted to him by the St. Petersburg Academy, which, moreover, was irregularly sent. His circumstances became embarrassed, and he resolved to leave the country secretly and to return home. On his arrival in Russia he rapidly rose to distinction, and was made professor of chemistry in the University of St. Petersburg; he ultimately became rector, and in 1764 secretary of state. He died in 1765. The most valuable of the works of Lomonosov are those relating to physical science, and he wrote upon many branches of it. He everywhere shows himself a man of the most varied learning. He compiled a Russian grammar, which long enjoyed popularity, and did much to improve the rhythm of Russian verse.